Back when the original Fat Princess hit the PS3 in 2009, at a glance I always thought of it as a cute but bloody 32-player online game with a hilarious mechanic that made it tougher for the opposing team to rescue their princess. It was highly recommended back in the day as the digital game to get if you owned a PS3. Now in 2015, the franchise remains a Sony exclusive and moves forward with a different approach on the PS4. Was this a good change for Fat Princess? Let’s dig in. With Fat Princess Adventures, it’s now a 4-player co-op hack-and-slash RPG, placing you and your friends on an adventure to face the evil Bitter Queen. The play style may now be different, but the charm from the original game still remains. The Blue and Red kingdoms are at peace. The two sides have found a way to live together. But of course peace is only short-lived, and you and a bunch of friends head out for cake and country! The gameplay is easy to pick up. You have square as your primary attack, and triangle as your secondary attack, and each of these attacks have a charged version if you hold the button. The kicker here is that you can swap between the four classes available (Warrior, Archer, Mage, Engineer) once you approach the class monuments placed everywhere in the game. Once near, simply pressing the directional buttons on the PS4 controller allows you to quickly change your class, providing new attacks to play around with, different life totals, and class-specific gear. As you progress, you will find chests and enemies that drop loot. These new pieces of equipment are not to just to increase your damage input or defense; they also provide passive abilities to your class. For example, a shield that gives your Warrior a chance to recover health from a successful block; a dagger for your Archer that can ensnare enemies in a web and slow them down; or a piece of gear that emits electricity around the Engineer as he jumps, damaging enemies near him. It was interesting to mix and match the different pieces of equipment, switching classes every now and then based on the current situation. However, combat with each class, despite the bonus effects from your equipment, can become simple and repetitive in the end. This is more apparent while playing the campaign solo. Playing online or with friends couch co-op style can alleviate the basic gameplay through the sheer chaos of multi-player mayhem. Fat Princess Adventures may look charming and childlike thanks to the saccharine visuals, but this game is no walk in the park. You get swarmed pretty quickly, leading to a few deaths, so I had to be alert at all times. Bosses in the game are fun to play rather than tough to beat. You encounter a good amount of them during the campaign, and they start off in an invincible state. These encounters have interesting mechanics that entail making the bosses vulnerable to your attacks. One boss required a Chicken Wheel: a chicken and metal flooring. It’s weird, yes, but that’s how the game is. 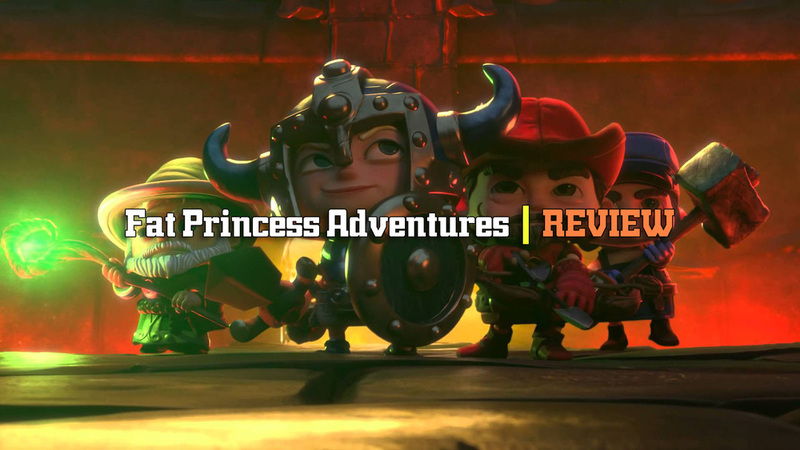 Be it through music, story, or gameplay mechanics, Fat Princess Adventures will always find a way to shower you with its wit and personality. It's easy for me to define this game's strongest highlight – its humor. From the narrator to the absurd situation currently at hand, I found myself cracking up at a variety of things. I’ve ventured out to encounter Vegan Pirates and brawl against ghostly bakers (that are apparently part of a baking reality show?). You regain health by eating cake dropped by foes, and eating while at full health grows your character as obese as a fat princess for a short time. This game never takes itself seriously, and the hilarity kept me pushing through the campaign for the sake of seeing more silliness. The overall plot is simple, but every goofy instance leading to the final conflict kept me smiling. Once I completed the first task of the game, which was to defend the kingdom from a gobbling (Goblins) attack, I was given the freedom to explore. Looking around, I was able to choose from a variety of side quests scattered around the town. Most of the ones I picked up are fetch quests, simple tasks that seem to be fodder, giving a player something to do if they tend to hang around town. In one side quest, a red soldier tasked me with delivering a love letter to a girl in the blue army, which entailed simply looking for the quest icon in the mini-map and giving the letter to the girl. Side quests in general felt out of place. Some may require you to go to areas infested with enemies, but they still fell under the same formula of finding something for an NPC and getting your reward. The prizes for doing such tasks aren’t enticing enough to make them stand out. In addition to the gold you collect being used to upgrade your equipment, there’s a leveling system. As I racked up experience, I didn’t see much of a point to the leveling-up. From what I can tell, the level of your character only unlocks more options to customize their looks. This turned out quite unusual since I got pumped acquiring experience only to discover that there’s no real use to EXP aside from cosmetics, which are quite limited to begin with. As you bash through all the objects in the game, killing enemies in your way, they'll drop gold, which is useful for improving your preferred equipment. Each upgrade simply improves the damage of a weapon, or your armor's defense. It’s quite basic if you compare it to other games. As you hit the 5th upgrade to an item, you'll now require gems along with a handful of gold to upgrade further. From what I can tell, these gems can only be earned at the end of the game (I got one when I finished the game), and probably through the Grindhouse mode, which allows you to replay certain sections in the campaign with added modifiers picked via a slot machine, providing more challenge for the player. There’s also two higher difficulties unlocked once you finish the game the first time, so I assume going through the campaign again at a higher difficulty with the same gear could reward you with another gem to spend. This feels like a form of endgame grind if you wish to fully upgrade your equipment. I played a bit of Grindhouse, but there’s not much incentive to replay past levels aside from upgrading or acquiring new items to play with. The experience dragged a bit at the outset. With Fat Princess Adventures' simple gameplay, I found myself struggling to push myself to keep playing. As I did so, the personality and humor of the game started to grow on me. It’s not even close to being a deep RPG along the likes of Torchlight, nor is it as straightforward as Gauntlet, but I found pleasure in going through this 6 to 7-hour campaign. This game is definitely best played with friends. Combining the different classes together is chaotic fun, and the humor found in every corner of the game will also entertain those present in the room. Online co-op is possible, and if you set your room to be open to the public, anybody can just jump in and join you. The overall adventure was a sweet one. Its simplicity might turn off players overly familiar with the genre. My love for the humor in the game proved to be a big personal highlight, but some might not appreciate it, and if you take that away, well, I don’t see the gameplay holding up on its own. I got my hands on the hotly anticipated Star Wars: Battlefront reboot, a multiplayer-only title that not only aims to deliver a perfect experience for Star Wars fans, but to live up to what has made Battlefront a beloved franchise. Did it deliver? Come closer and relax a bit, I think you’ll need to sit down for this one. When it was announced that the studio DICE would be in charge of rebooting the Battlefront franchise for the next generation, it seemed like a fitting choice thanks to their work on the Battlefield games. Star Wars Battlefront focuses on the original trilogy and lets players participate in epic battles on known and beloved Star Wars locations. Jumping in, everything felt perfect – the immersion of being in a Star Wars battle was there. The blaster sounds, the John Williams music, even fearing the possibility of Darth Vader approaching in a narrow corridor. I had a big smile on my face as I played, confirming that my inner Star Wars fan was happy. I have to quickly commend DICE for pulling this off because the presentation was finely executed. Performance-wise, there were no FPS drops or bugs/technical issues that ruined the immersion during my time with the game. The details on each map and vehicle are such a treat, showcasing DICE’s commitment to this project. This is probably the best-looking game this year. Definitely a polished product. Going through a couple of battles, I found satisfaction picking up those power-up cards found on the map that allow you to pilot an X-Wing to provide air support, or helm, say, an AT-ST or AT-AT to push the advance. If you’re lucky, you might just grab the Hero power-up, become one of the three heroes or villains on the map, and make a difference on the battlefield. The powerful heroes allow for a variety of epic scenarios that make for great stories to tell your friends as well as fun .gifs. As I continue to play more of the game, though, I'm feeling a disturbance in the Force. I find myself experiencing the same things over and over. The magic is wearing off. The true essence of Star Wars Battlefront can be found in two modes: Supremacy and Walker Assault. These modes allow for 20vs20 matches with vehicles and heroes enabled. It’s chaotic fun, and they are easily the preferred game modes among the nine available. The one big issue is the lack of maps available for them. Among the 13 maps found in the base game, there are only 4 big maps catered to these modes. They are quite large, but it's just not enough, since the sense of the Battlefront's gameplay being repetitive was present early on, which is quite a surprise after just one night with it. To change things up, I explored the smaller modes with player counts of 10v10 or 6v6, and found them more appealing thanks to their unique game modes. Yes, the common modes like Team Deathmatch and Capture the Flag are present, but a couple of the unique game modes turned out to be fun. I personally like Droid Run, which tasks you with having your team take control of three wandering droids on the map. If you want to play around with the heroes and villains in the game, there are two modes for that. Dogfights with TIE Fighters and X-Wings? There’s a mode just for that, too. It was pretty exciting to be actually piloting the beloved X-Wing ship, blasting away incoming TIE Fighters, but after a couple of matches, the mode went stale fast thanks to its basic gameplay. Once you get a lock on someone, you simply hold down the fire button and watch your opponent wither away. You only have one chance to avoid a lock-on too, so there’s only so much you can do once an opponent is on your tail. The outcomes can be dependent on which skills are available as well. Since I can only pick what ship to spawn as with no way to customize their loadouts, this mode is an act of fan service more than anything. Since aiming at tiny ground units is tough, aerial combat is best enjoyed during Supremacy or Walker Assault, where you can potentially contribute to the overall job. The developers provide a lot of variety for the players, but most of it feels like fodder in the end, modes to prepare you for what I consider are the main course of Battlefront – Supremacy and Walker Assault. Probably after five hours with the game, I noticed a more troubling issue – progression. It’s simply lacking. There are no classes in this take of Battlefront. Instead, you can bring two equipment cards (grenades, jetpacks), one ability card (reduced cooling ability, explosive shot), and one trait card (a Passive ability which improves through kill streaks). As I unlocked more cards and tried different combinations, I noticed that my play style hadn’t changed at all. The only time it felt different was when I first unlocked the jetpack, giving me access to new areas in the map to take advantage of. Equipment cards can be upgraded at a hefty cost, but the only change to this equipment is a reduced cooldown. Customization for your character is probably the worst I’ve seen in a multiplayer game. I stared at the screen for a few seconds when I found out that I have to spend 1,700 of my hard-earned credits to unlock a bearded Rebel character, or unlock a Stormtrooper without his helmet. You can play as an alien if you really want to, but those require a higher rank of around 45. There are also emotes to unlock, if you’re into that. This was quite disappointing considering the deep progression found in DICE’s past games, leaving me worried about this game’s staying power. There is no campaign in Star Wars Battlefront. But if you want to take a break from multiplayer, you can opt for the missions that can be played with split-screen co-op or online co-op. These, again, are fodder content at best. Four survival missions pit two players against 15 waves of AI enemies. Battle missions are simple tasks that require you to earn points by killing the opposing NPC team. There are also battle missions where you can play as a hero or a villain. Doing these missions once for the sake of trying them is all you need, really. The rewards for full completion or even attempting them on a higher difficulties are not enough to inspire another run. There are training missions to learn the different game mechanics, but I found no purpose in them, since everything I needed to know I learned by simply playing multiplayer. I had a lot of fun with Star Wars: Battlefront, I can’t deny that. It might be one of the best Star Wars games I’ve played, since it captures that universe (or to be more specific, galaxy) perfectly. But the content provided in the base game leaves me scratching my head. The maps and progression system are too lacking for a competitive FPS player to get truly invested in, so what more for the casual player? I got my fill in just a couple of days and am finding it hard to justify continuing to jump in with me currently at rank 25. DICE should be proud of what they’ve created, but I won’t be surprised if players have moved on after just a couple of days. Star Wars fans will enjoy this after warping in for the first time, but once the excitement of being in an epic Star Wars skirmish wears off, there’s nothing left to hold on to. EA and DICE announced a season pass for Star Wars Battlefront priced at $50, giving you access to 4 expansion packs for the game. The DLC pass will provide over 20 new pieces of weapons, vehicles, and Star Cards for both sides. Four more heroes and villains, 16 additional multiplayer maps, four new game modes, two-week early access to each expansion pack, and an exclusive “shoot first” emote. No date was given for when the first expansion will hit. 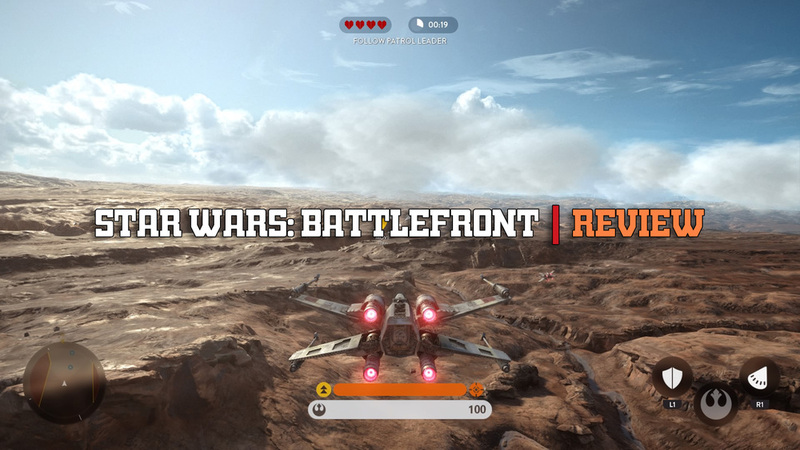 A free map called “Battle of Jakku” was announced and will be available for all players on December 8. Those who pre-ordered the game will get early access to the map as early as December 1. A new 20v20 game mode called Turning Point will come for free with the Battle of Jakku map. Ever since 2K took over the WWE franchise, wrestling games have been in a sort of odd area between trying to stay fresh and aiming to capture all the nuances of professional wrestling while retaining enough familiarity and arcade elements to keep matches fun and exciting for players. That said, it was with some trepidation I entered into this review, since not only was last year’s outing was met with a somewhat lukewarm response, but I haven’t followed professional wrestling, nor played a wrestling game, in several years now. Thankfully, WWE 2k16 proved to be a step in the right direction for the franchise, and although not perfect, 2K’s newest still remains a thoroughly enjoyable title and probably the best offering for wrestling fans on the market today. There’s certainly a lot to dig your teeth into, and any wrestling fan will find tons of material and content to work through in this year’s outing. Off the bat, 2K16 has a plethora of game modes to jump right into. Showcase mode allows you to play through the career of Stone Cold Steve Austin, with actual clips from the broadcasts to help bring up the nostalgia factor for fans. Universe mode plays out just like the real WWE – where you’ll be questing for the belts across Raw, Smackdown, and PPV events, with all the rivalries and drama that would entail. MyCareer mode lets you take your own personal superstar into the WWE, working their way up from NXT up to either Raw or Smackdown depending on your choice. Let’s not forget the selection of quick matches, from simple one-on-one affairs, to Hell in the Cell, to 30-man Royal Rumbles. 2K16 is bursting at the seams with content that would keep anyone occupied for months. Adding to all this, we are also getting the largest roster in a WWE game to date, with over 120 superstars. Not only will you find a comprehensive, up-to-date roster of today’s wrestling superstars and divas, but also a bevy of classic superstars such as Bret Hart and Andre the Giant, alternate era superstars (Sting has three separate variations alone), and managers such as Jimmy Hart and Paul Bearer – who can add an extra level of drama to a match with their inclusion. There are a few notable exceptions missing, such as Rey Mysterio and Hulk Hogan, but it’s not a major problem in the greater scheme of things. On the topic of customized superstars, the character creation system is probably one of the more robust ones I’ve seen, and you can create just about any original type of character you want. Getting to the gameplay, 2K16 sports a complex system that manages to be both deep and seamless at the same time, punishing button-mashers and rewarding good timing and using a variety of moves. For example, mixing in several strong attacks with some weak attacks and blending it all into a German suplex serves one much better than constantly spamming a single attack. Furthermore, superstars can now only counter a limited number of times, storing up to 5 counters which slowly get refreshed over a match. This means there is some strategic thinking involved in knowing what moves to let through and which ones not to. This sort of dynamic, which rewards move variety, coupled with smart countering, keeps matches flowing forward and engaged me throughout every match I played. Subtle touches have also been added that just add extra drama to each match. You can opt to interrupt ring entrances if so desired, starting the match early and getting that extra hit or two in from the get-go. Heel characters also have access to tools such as dirty pins using the ropes, while managers can distract or interrupt a match for a critical save. These small touches really help bring a match to life. When things fall together, 2K16 is an amazing game to behold. The developers has done its utmost best to make you feel like you are watching a wrestling telecast. The video transitions are spot-on, while ring entrances no longer need to load individually, making the whole match start a seamless affair. For the most parts, wrestlers talk, walk, move, and act as you’d expect their real life personas to. The ring itself reacts to what’s happening on screen in a realistic fashion, and the action camera, when it works, gives you a real televised feel to the whole affair. Couple all this with a butter-smooth framerate, some brilliant commentary (which rarely ever uses the same phrases twice in a match), impactful ring sounds, a roaring crowd, and it’s an already exhilarating affair just watching a match unfold on its own. Despite these issues, 2K16 succeeds more often than it fails – it’s just a shame that it couldn’t be more consistent throughout. Multiplayer was a mixed bag – couch multiplayer is certainly fun – and there’s nothing like participating in a 30-Man Royal Rumble with your friends. And while the game does feature online play and matchmaking (which works decently well), there isn’t anything particularly compelling to do online when compared to the amount of single player content available. However, those looking to make a name for themselves online at least have the opportunity to do so. Overall, WWE 2K16, while not perfect, paves the way forward for future games in the franchise in exciting and good ways. If you were waiting for wrestling games to hit its stride after the disappointment of last year’s outing, it is safe to say WWE 2K16 is on the right track. Even when taken by itself, it’s an extremely solid package; despite its inconsistent presentation, 2K16 remains an extremely fun outing, and a wonderful gift for any wrestling fans. The moment we saw the first trailer, we already knew Bloodborne was going to be something special. Bloodborne is the latest action role-playing creation from Hidetaka Miyazaki. Miyazaki made a name for himself beginning with Demon Souls on the Playstation 3 – a dark, foreboding fantasy RPG which grew in infamy for being unforgivingly difficult, a game where death was a regular occurrence, to be made part of the overall gameplay experience. Add to this a return to old school gaming mechanic, an amazing atmosphere, merciless boss battles, and a unique multiplayer system, and you had the making of a classic. It’s no secret – we are BIG fans of Miyazaki’s work here at TMG, and Bloodborne carries on his vision to the Playstation 4 in style; It’s a brutal, terrifying, and absolutely seductive offering, with enough differences to set itself apart as a truly next generation version of its predecessors while maintaining just enough familiarity to pull back in those already well versed in his works. That said, the game isn’t perfect, and while we have to objectively point out its flaws, none of them really detracted from the overall experience. So let’s jump into it shall we? Bloodborne takes place, for the most part, in a Victorian-era dystopia known as Yarnham. This is a city steeped in religious imagery and gothic architecture, whose residents fearfully lock themselves inside their homes at night as werewolves, rabid dogs, mad cultists and other dreadful creatures of the night come out to stalk the streets. It is into this that you are thrust as a newly inducted Hunter – one of the chosen few who hunts the evils of the night. It’s a setting that combines the best of Bram Stoker, Mary Shelley and HP Lovecraft all rolled into one, and it is lovingly realized. Imagine every creepy church, cemetery, house, and building you’ve ever seen all within a single city. This is a city of constant dread and horror, yet also one of incredible beauty. Graphically, Bloodborne is absolutely gorgeous. Environments are well detailed and interesting, every brick and tombstone lovingly rendered; indeed, moving the camera up close lets you fully appreciate the work that has gone into making Yarnham feel like the nightmare that it is, with small details seamlessly popping into view as you close in to examine the environment. Even details on character clothes and weapons are all fully realized, all of it wonderfully lit by a giant moon in the sky that gradually turns red and foreboding as you progress through the game. Monsters and creatures are equally lovingly crafted and animated, oozing personality even with little to no dialogue attached. Almost every denizen of Yarnham you encounter is hostile, and all are equally deadly. Even the lowliest cultist can quickly cut you down if you aren’t careful. Combat in the game doesn’t stray too much from the set formula of previous Soul’s games and adds a few interesting elements to the mix, so those familiar with the previous titles should feel right at home, with one exception – there are no shields in the game anymore (actually there is one shield, but it’s so pathetically weak that it was certainly only put into the game as some sort of cruel joke.) The lack of a shield means you now need to be quick on your toes to react appropriately to your opponent’s moves, dodging and weaving in and out of range while taking shots of your own when the opportunity allows. The result is combat that is much more reaction heavy; you’ll need to be paying attention here if you want to survive. The game rewards you for taking risks however – retaliating against your opponent within a short time frame after being hit can regenerate the health you lost, leading to an interesting dynamic where you need to temper your patience with bravery. It’s an excellent dynamic that, coupled with the lack of a shield, leads to some exciting combat encounters. We cannot discuss combat further without tackling the issue of death. And let’s be honest here: No matter how good you think a player you are, you will die, several times, as you play through Bloodborne. Dying is obviously something you want to avoid, but thankfully because of Bloodborne’s excellent combat and design, it almost never feels unfair – more often than not, you die because of something you did or failed to do, and the game forces you to learn from your mistakes. It can get frustrating at times, but there was never a point where I felt like I just wanted to give up – rather I was spurred on forward more to keep trying until I got it right. The most common area of death always tends to be with the boss encounters, and Bloodborne has some of the most memorable boss encounters to date in any video game. Some bosses are huge monstrosities several stories high, slow and lumbering but with incredible power behind each swing. Some are humanoid sized, quick, agile and deadly – you’ll need to be patient, watching for patterns and openings in order to succeed. Defeating a boss in Bloodborne always feels like an achievement, and it’s once again a testament to just how tight the combat design really is. The leveling system is also quite robust, despite being very simple, and allows for a lot of experimentation – a clear sign that this game was meant to be experienced multiple time over. With so much good in this game, it’s so easy to overlook Bloodborne’ shortcomings, but the truth is it isn't a perfect game. Interpreting your character statistics can be quite a chore without an external reference, and the story of the game is not always communicated very well throughout. Yes these are relatively minor in the overall scheme of things. While it may not have the flash or pizazz of your traditional AAA title, the quality and care put into crafting it is clear – and many companies could only ever hope to come close. The bottom line is, if you own a Playstation 4, you need to play Bloodborne. It is easily the best Playstation 4 exclusive to date, and so far one of the best contenders for Game of the Year. Willem went through the game completely offline in order to have a blind playthrough experience. Carlos' Note: The online aspect of Bloodborne is greatly similar to previous Souls games. Messages are left on the ground for players to warn them of incoming dangers or an item they could possibly miss. There are also pools of blood which shows another players last moments before death. Player vs Player is present in Bloodborne but is taken a few notches down compared to previous Souls games. Using the item the Beckoning Bell (co-op play) or the Sinister Bell (Invading players) will trigger online play. Player vs Player seems to take a backseat this time around since you can only invade in certain areas that have the bell bearer and if a player used the Beckoning Bell. depending on the items used to create the dungeon. It's a great addition to the Souls formula and added extra hours of gameplay since there are bosses and items exclusive to chalice dungeons.